Home / Hair / Virgin? Expeller pressed? Organic? Cold pressed? Centrifuged? How do I choose the best coconut oil? After my last post – 50 amazing beauty tricks with coconut oil – I have received tons of queries about the best type of coconut oil available in the market. How do you pick the best, most healthy version? Which one will work best for the skin and hair? What do “cold pressed”, “centrifuged”, and “expeller-pressed” mean? And what is the difference between the cheap coconut oil you see on the department store shelf and the high-quality oil you can buy in a health food store? The answer is that (much like olive oil) coconut oil is graded according to its level of refinement. And here is a list of what the various designations mean. Consider this your definitive guide to choosing good coconut oil. Virgin Coconut Oil (VCO) is crafted from fresh coconut meat with minimal application of heat or chemicals. 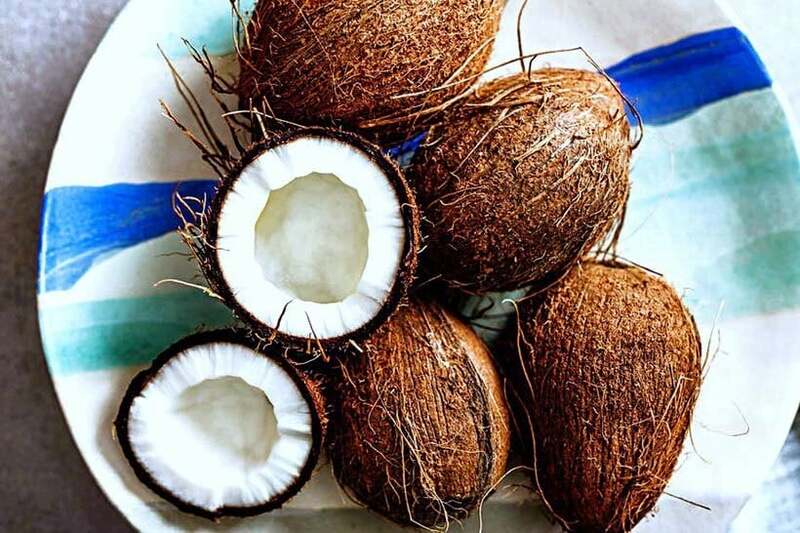 It smells and tastes strongly of coconuts besides being laden with anti-oxidants, medium chain fatty acids, capric acid, lauric acid, caprylic acid and vitamin E. VCO also has remarkable anti-microbial properties and can be pure white when solidified or crystal clear when liquefied. This is a misnomer as, unlike olive oil, there is no industry standard for distinguishing between “virgin” and “extra virgin” for coconut oil. Therefore, a coconut oil labelled “extra-virgin” is probably the same as one labelled “virgin”. Extracted by manual compression (cold pressing) from dried coconut kernels (copra), pure coconut oil is unrefined and without any additives. More expensive than RBD, it is used for cooking, massage, hair treatments, medicines and confectionary items. However, most crude oil is converted to RBD before selling, thereby making pure coconut oil more expensive and less easily available. Also, known as RBD, which stands for “Refined, Bleached & Deodorised”, refined coconut oil is golden in colour and laden with pure saturated fats. It is obtained by mechanically and chemically refining, bleaching and deodorising the crude coconut oil, which makes it tasteless and odourless. The economies of mass production make it the cheapest, most easily available form of coconut oil and it is good for cooking foods where you don’t want a dominant coconut flavour (think pie crusts or french fries). However, refined coconut oil does not offer the same health benefits as the virgin variety – like proteins, anti-oxidants and vitamins. In fact, it can actually contain some pretty nasty stuff, so you need to make sure you’re getting a quality product – preferably one that’s cold pressed. As a given, almost all the coconut oils available in your grocery store or vitamin store are refined unless they specifically say otherwise on their label. This oil is extracted from coconuts that are grown on organic manure, with no synthetic fertilizers, insecticides etc, and eschew the involvement of any chemicals in extraction or processing. However, organic coconut oil is scarce and comes at a high cost. The most premium variety is organic virgin coconut oil – the best and purest form of coconut oil. However, it is very scantily available since this combination of virginity and organic cred is rarely matched. These are methods of extracting the oil from the coconut and can be found in both refined and unrefined varieties. Cold pressing: This is one of the oldest methods of extraction and involves the use of mechanical means to squeeze oil out of the coconuts. Heat pressing methods (including centrifuge and expeller) can degrade the oil’s quality and alter characteristics like taste, odour, colour and texture. Cold pressing extracts a relatively smaller amount of oil but retains most of its nutrients. Centrifuge: During this process, coconut meat is emptied into a machine that chops it into tiny pieces. First, the milk is extracted from the meat; then the remaining coconut is placed in a high speed centrifuge that rapidly spins the contents (and generates a high amount of heat due to friction). Through this spinning process, the oil is separated from the meat. Centrifuge coconut oil retains a strong coconut taste and smell and requires no further refining. Expeller: Heated coconut is placed into the barrel where it is crushed by a rotating metal rod to break down and prepare the meat for oil extraction. Then, the extractor uses a chemical solvent (hexane) to separate the coconut from the oil. Further refining is often necessary to cleanse the extract. Chemical extraction: These oils are refined using a chemical distillation process dependent on lye or other harsh solvents, or they’re made from the rancid oil by-products leftover from creating desiccated (dry) coconut flakes. They are often hydrogenated or partially hydrogenated. Avoid at all costs! Do you use coconut oil? Which one’s your pick? « Lip care with a hint of color: The best tinted lip balms for your pout! I use organic coconut oil from the grocery store on my face, hands, body and hair!. It is a bit grainy and so my question is; is this good for me or does it colg my pours! It is essential for healthy skin growth, repair of wear & tear on the skin, keeping skin smooth and protecting against cracking. As a result, when applied on the skin it is better oil than other oils. Is the refined one allowed on your skin? I see several suppliers are selling organic tasteless, odourless coconut oil. Reading your post, surely that would destroy the goodness of the coconut’s being organic? Organic means next to nothing with most substances or whole fruits/vegetables provided. Obviously, some like myself hate the perpetuation of the idea that major corporations such as ”Genetic Seed Distributors” should hold all the cards but ORGANIC- Vs. NON-ORGANIC fight is a capitalist fight at it’s base. So therefore, both sides are being greedy and in fact most of the time I’d with with the ”NONs”. Largely when it deals with mass agriculture I would side with them as they are half half on health benefits and detriments SAME as the Organic side they both have potential positive and negative side-effects. But the NONs are often simply more environmentally friendly and they feed far more people. So for the article suggesting Cold-Pressed and all of that is fine considering research (proper research on that topic) is more easy to come by. But organic shouting is complete hogwash and without any discussion or genuine proof behind organic being better within that specific agricultural sub-class (i.e. on that specific product/class of products; e.g. Bananas versus Tomatoes – as both are fruits but organic may or may not be good for one and worse for the other). Going back to the initial paragraph, I completely understand obviously not wanting to be duped into purchasing something that contains a facade (such as colouring, or additives for textures, and so on)… I really do. But Organic is probably the worst example of HOW-TO fight that system. It is already almost completely overtaken by most industrial-scale agricultural corporations. SO I’d really rather us picket in front of ”Parliament Hill” or Whatever governmental houses you have in your territories and lands, moreso than simply give into our ”Quick-Fix” nature of ”Organic Just Sounds Like It’s Obviously Purely Natural and Good”! Thanks so much for sharing these tips for choosing coconut oil! I had no idea that there were so many different ways of abstracting the oil from it. I will definitely avoid chemically refined oils! Cold pressed really seems to be the way to go! I’m sure that cold pressed will become easier with the rise of robot factories to do all of the work! I have been using (1 tablespoon/day) virgin, cold-pressed coconut oil for the past 5 years, along with other vitamins. My supplier, a local department/supermarket store, switched to a virgin, cold-extracted by centrifuge process coconut oil. How different are the effects? While cold pressed coconut oil is the purest, due to lack of heat, it’s also the most expensive – which is why your supermarket may have switched. But don’t worry. Centrifuged coconut oil is also top quality, retaining most of the nutrients. Newer centrifuge machines allow extraction with much less heat, so you are still on the right track. This is very cool tips. I will follow your instruction to select my coconut oil. Very much appreciate for sharing this one.